I am a motivated and energetic UCBerkeley (B.S. '04 in Engineering Physics) and USC alumnus (Graduate studies in Biomedical Engineering) with over 17 years of tutoring experience to middle school, high school, and undergraduate students in a variety of topics. I also have extensive experience in applying many of the topics I tutor though hands-on research experience in world-class research institutions such as Lawrence Berkeley National Laboratory, IBM Almaden Research Center, California Institute of Technology, University of California at Berkeley, University of Rochester, and Swiss Federal Institute of Technology in Zurich, Switzerland. A more detailed resume is available upon request. My rates are generally very flexible and range between $50-$70/hr depending on the subject of study. Group discount is also available to a group of 2 or more students. Please send me an email with your name, number, subject of the inquiry, as well as availability and best time to contact, and I will be in touch with you shortly. "Sepehr is undoubtedly the tutor you want to prepare you for challenging classes! He tutored me through Physics 8B at UC Berkeley and by the end of semester, I honestly felt ready for the final. He thoroughly explains all of the material, and is very, very good at answering questions. That said, I really appreciated how devoted, organized, and patient he was all throughout the semester. He also comes out to Berkeley two times a week, so it is very convenient to meet with him. If you are a dedicated student that is serious about your work, this tutor is the one for you!. " "I have always struggled significantly with math. A requirement for acceptance to my graduate program is Physics which terrified me. It had been 10 years since my last math class and I was completely unprepared for physics. Despite studying very hard for my first exam, it came back with an "F" on it. My options were either drop the class or get a tutor. After speaking with Sepehr I was convinced that I'd be able to make it through physics. After just one session I was able to understand the material more thoroughly and my next exam grade jumped to an "A". My grades remained high and I completed the course earning an "A" overall. Sepehr went above and beyond to make sure that I truly understood the material. He was able to identify why I was having trouble and adapt his style to get at the root of my difficulties. Additionally, he pushed me to work hard. He was genuinely proud of me when I did well which motivated me even more so I would not let him down. Sepehr is very intelligent person who seems to receive great satisfaction from sharing his knowledge. " "I remember being so lost and so confused when I first started out in the CS field in college. It was hard getting by class and understanding what was actually going on. One of the biggest reasons was that I never had a CS background back in high school. With the already fast pace of the class, the lack of a CS background made things exponentially harder to the point where I just felt like I was falling back behind the other students. Understanding my situation, I went through several tutors to try catch up, but none of which really showed me how to go about completing a project. Instead they just told me the answers, so I ended up learning nothing. They helped me survive school, but I wanted to excel in it. This "show not tell" style of teaching, the most effective in my opinion, is a skill that Sky Tutoring has mastered. My tutor understood my situation from the very beginning of our sessions and even developed a personal plan for me to learn as much as possible. He knew right away, which fundamental concepts I lacked and which concepts I was already strong in. Many tutors before were able to get me the grades I wanted, but Sky Tutoring gave me the fundamentals and more. Learning and understanding is the number one priority of Sky Tutoring; thanks to my tutor, I felt at ease whenever I had an upcoming cs project. For grades, you can go to any tutor. But for gaining a refined set of skills that can last you a lifetime, I highly recommend Sky Tutoring." "I would like to recommend Sepehr as an Algebra, Geometry and Chemistry tutor. He has tutored my daughter in these 3 subjects during the past 7 months and her understanding of the subject matter and her grades have improved significantly. His knowledge of the subject matter is outstanding. He has the ability and communication skills to take complex and complicated materials and make them easy to understand. My daughter looks forward to her tutor sessions with him. He has taken 3 very hard and boring subjects and made them exciting and fun to learn. I whole heartedly would recommend him for anyone who needs assistance with Algebra, Geometry or Chemistry. He truly is a professional. If you are looking for a tutor in any of these subjects, both my daughter and I agree, he is the "Best"." "Sepehr was very helpful and very patient. He answered all of my questions with useful explanations, and made a big difference for me in learning C++ with almost no programming experience. He was generous with staying a little later at the end of the sessions when I needed more help." "Sepehr has been my tutor for math and physics for two years now. As a computer engineering major, my math and science courses have gotten pretty advanced, but I have yet to take a math or science class Sepehr couldn't help me with. So far, he has tutored me in Calculus 1, Physics: Mechanics, and Physics: Electromagnetism. I ended up getting A's and B's in all of those classes. I am a really hardworking and dedicated student, but everyone gets stuck sometimes. Sepehr has such a broad knowledge of the big picture that he can really help me understand exactly what it is I'm learning and what it's leading up to. He is really smart and is able to look at any textbook I've shown him and immediately know how to do it, what's important, how it fits into the big picture, and, most importantly, how to explain it to me. He's a great tutor and a great guy." 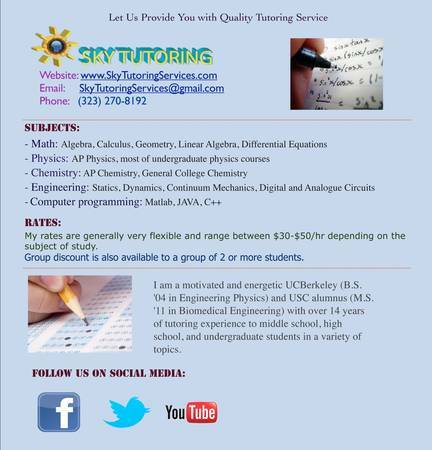 "I used Sky Tutoring services for Physics 4A at Berkeley City College (the equivalent of Physics 7A at UC Berkeley). Sepehr was very professional and always punctual for our meetings. He has a thorough understanding of the material and was able to help me work through some of the more difficult practice problems from the book. His explanations definitely clarified the information that was not presented in an approachable way during lectures. Overall I would recommend his services because by having him explain complex concepts during individual sessions, it is easier to absorb the material at your own pace." "After a few sessions with Sepehr I quickly realized I was not only receiving excellent tutoring, but I had acquired a mentor in physics that cared about my success and understanding of the material. Sepehr's vast knowledge of the subject allows him to answer virtually any question that deepens an understanding of physics. Most of my sessions showed little regard to a definite ending time of a two hour session where Sepehr and I often worked overtime in order to keep the momentum of a difficult problem going. Sepehr's energy and enthusiasm really helped trudge through some of the more difficult areas of physics -- I highly recommend this tutor that understands where you may be having difficulty and truly seeks to facilitate growth. I owe my final grade of an A in physics 4A (w/ Calculus) to the root understanding of physics that Sepehr helped me achieve." "I started Physics 1 and before I finished my first homework assignment, I realized I was in trouble. I had no concept of how to approach physics problems and my professor had no clue how to show this to the class. Sepehr showed me the proper way to approach the material and set up the problems. The class was still extremely difficult and frustrating, but I managed to walk away with an A-. Had I not sought Sepehr's help, I think I would have dropped the class. He explains material clearly and concisely and he drills you on how to build good habits when approaching problems. As long as you are willing to put the work in, he will help you to learn Physics very well." "Sepehr tutored me in Physics II, which covers electricity, magnetism, optics, waves, and sound. I did not do as well as I wanted to on my second midterm and so I was a little worried about not getting the grade I wanted for the class. I was also struggling with the concepts of magnetism and electricity. So I decided to meet with Sepehr and he was able to answer every question I asked in several different ways. Whenever I seemed unconvinced by his answer, he would try a different approach to make sure that I really understood what was happening. I met with Sepehr for two very productive 2-hour sessions. I got an A in the class and my success is due to the time I spent working out the concepts and problems with Sepehr. This man is also a workhorse. On one of the days, I was his 6th student and he was still energetic and sharp. He truly enjoys what he does." "Sepehr is an excellent tutor. He is very dedicated to his students and goes above and beyond to help them succeed. His knowledge of physics and chemistry is excellent and is very good at explaining key concepts it a concise manner that makes a very complex subject like physics much more manageable. I contacted Sepehr after receiving my first midterm grade and with 1.5 months of hard work and tutoring, I was able to drastically improve my grade in both subjects. Thank you Sepehr for your teaching and dedication.."
"Sepehr tutored me in Physics 4A and 4B. We had scheduled 2 hr sessions once a week and he was often willing to schedule additional sessions when there were upcoming exams. His explanations were thorough and he was very patient with me. He helped me feel much more comfortable taking these difficult classes."